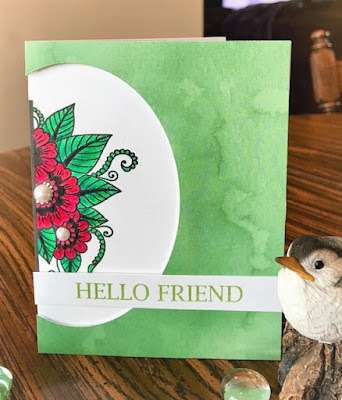 I have a card to share with you today for the Red, White and Green challenge over at Stamp TV (STV17MON42). ﻿﻿I stamped the flowers in black and colored them with pencils in a variety of reds and greens. Then, I used an oval die to cut a window in the green cardstock. I adhered the green layer with foam tape. Hard to photograph that for some reason today. I stamped the sentiment in grass green.